ntil recently the vineyards in the Pyrenées-Orientales département were best known in quality wine terms for the production of fine vins doux naturels. This situation is changing apace though, and there seems perhaps even more potential here than in the Languedoc. Some stunning reds have appeared over the past decade and the emergence of exciting new small producers continues unabated. One of the region’s great strengths is the extensive hillside vineyards planted to both old-vine Carignan and equally importantly Grenache. 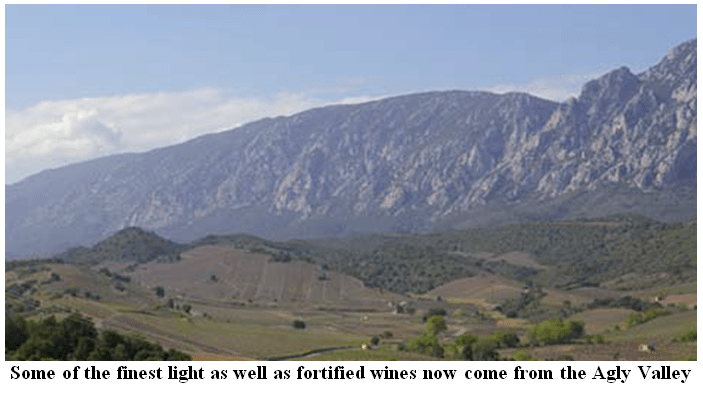 This is because of the traditional importance of fortified Rivesaltes and Maury, from north of Perpignan, and of Banyuls-sur-Mer, another fortified wine further south on the coast. Exciting wines are being made throughout the Côtes du Roussillon and the Côtes du Roussillon-Villages ACs, particularly in the Agly Valley in the north western stretches of the Côtes du Roussillon-Villages appellation. As well as Grenache, the other Rhône varieties are important too, and a number of top cuvées vinified largely from Syrah and aged in high-quality new oak are also emerging, along with the occasional exceptional blend dominated by Mourvèdre. On the coast around the village of Banyuls-sur-Mer the Collioure appellation shares the same vineyard area as Banyuls. Syrah, Carignan, Mourvèdre and Cinsault are all cultivated here but interestingly it is Mourvèdre planted in close proximity to the sea that has performed particularly well, as it does in Bandol. The IGP des Côtes Catalanes is also increasingly important for red blends and these include Cabernet Sauvignon and Merlot. Some exceptional light style wines are again made in the Agly Valley. There is a tremendous resource of old vine Grenache and Carignan. Many top producers have emerged, although not all use the IGP classification. The great traditional wines of the Roussillon are the fortified Maury, Rivesaltes and Banyuls, which in their most exquisite and aged manifestations are characterised by an intense baked, raisiny, rancio character. A whole range of styles are produced, with small differences between the appellations. Almost all these wines depend on Grenache as the backbone of the blend; indeed, many are produced solely from the variety. There are youthful, fruit-driven styles that spend only a limited time in cask, wines that are aged for an extended time and wines that are made from a blend of vintages very much in a solera-style system. The wines of Maury tend to be more overtly tannic when young and those earlier-released vintages will need more cellaring. Most wines are aged in cool cellars but in Rivesaltes they are also left out for a period in the summer sun in large glass containers – bonbonnes – to encourage the development of those complex rancio aromas. As well as the Grenache-based wines there is some very impressive Muscat de Rivesaltes, which is markedly different in style. At their best these wines emphasise Muscat’s rich grapy character, and are heady and impressively perfumed. Indeed, the best examples are better generally than their equivalents in the Languedoc and the Rhône Valley at Beaumes-de-Venise.